Originally published under the title "Here's Where the Phrase 'Islam Is A Religion of Peace' Came From. Politicians Should Stop Using It." Days after the ISIS-inspired terrorist attack in San Bernardino, President Obama's address to the nation concerning the threat of ISIS missed the mark. In fact, President Obama seemed at times to be more concerned with Americans ostracizing Muslim communities through "suspicion and hate" than he was with protecting innocent American civilians from murder in the name of radical Islam. It is high time for Western political leaders to stop responding to terrorism by naming Islam as "the religion of peace." It is time to have a hard conversation about Islam. The slogan "religion of peace" has been steadily promoted by Western leaders in response to terrorism: George W. Bush and Jacques Chirac after 9/11, Tony Blair after 7/7, David Cameron after drummer Lee Riby was beheaded and after British tourists were slaughtered in Tunisia, and François Hollande after the Charlie Hebdo killings. After the beheading of 21 Copts on a Libyan beach Barack Obama called upon the world to "continue to lift up the voices of Muslim clerics and scholars who teach the true peaceful nature of Islam." The claim that Islam is a 'religion of peace' first appeared in the 20th century. One may well ask how "the religion of peace" became a brand of Islam, for the phrase cannot be found in the Qur'an, nor in the teachings of Muhammad. Islam was first called the "religion of peace" as late as 1930, in the title of a book published in India by Ishtiaq Husain Qureshi. The phrase was slow to take off, but by the 1970s it was appearing more and more frequently in the writings of Muslims for Western audiences. What does "religion of peace" actually mean? Words for "peace" in European languages imply the absence of war, and freedom from disturbance. It is no coincidence that the German words Friede (peace) and frei (free) sound similar, because they come from the same root. While there is a link in Arabic between salam, a word often translated "peace," and Islam, the real connection is found in the idea of safety. The word Islam is based upon a military metaphor. Derived from aslama (surrender) its primary meaning is to make oneself safe (salama) through surrender. In its original meaning, a Muslim was someone who surrendered in warfare. Thus, Islam did not stand for the absence of war, but for one of its intended outcomes: surrender leading to the "safety" of captivity. It was Muhammad himself who said to his non-Muslim neighbors aslim taslam, "surrender (i.e. convert to Islam) and you will be safe." The religion of peace slogan has not gone uncontested. It has been rejected by many, including Ayaan Hirsi Ali and Melanie Phillips writing for The Times, who called it "pure myth." Even among Muslims the phrase has not only been challenged by radical clerics such as Abu Bakr Al-Baghdadi, the leader of the Islamic State, but also by mainstream Muslim leaders. 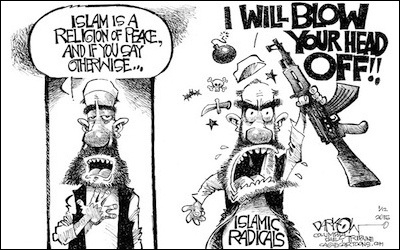 Western leaders invariably respond to Muslim terrorism with pronouncements about Islam's peacefulness. readily accept this 'defense' as valid and begin bringing forth one piece of evidence after another to demonstrate that Islam is, indeed, a peaceable, conciliatory religion which has no reason to interfere in others' affairs. ... The aim ... is to erase the notion of jihad from the minds of all Muslims. There does seem to be something to Al-Buti's theory, for it has invariably been after acts of violence done in the name of Islam that Western leaders have seen fit to make theological pronouncements about Islam's peacefulness. Who are they trying to convince? In the long run this cannot be a fruitful strategy. It invites mockery, such as Palestinian cleric Abu Qatada's riposte to George Bush's declaration that "Islam is peace." Abu Qatada asked: "Is he some kind of Islamic scholar?"